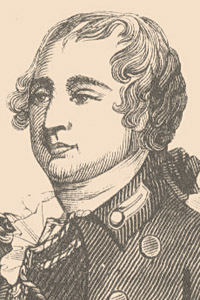 Masonic historians J. H. Graham, Albert G. Mackey and Robert Freke Gould have all, erroneously, claimed Sir Guy as a freemason, confusing him with Christopher Carleton, his nephew and brother-in-law, who was appointed Provincial Grand Master of the Grand Lodge of Quebec in 1786. Sir Guy knew several freemasons. His brother-in-law, Thomas, 3rd Earl of Effingham, served as Acting Grand Master of the Premier Grand Lodge of England from 1782 until 1789, and his friend, Sir John Johnson, succeeded Christopher Carleton as Provincial Grand Master in 1788. He was also a friend of Colonel Benedict Arnold. Sir Guy was also, at one time, attached to several regiments with travelling lodges: the 7th Foot, Royal Fusilliers held Warrant No. 231, the 20th Foot carried a warrant for Lodge No. 63, "Mindem Military Lodge", the 25th Regiment of Foot were issued the Irish warrant of Lodge No. 92 in 1738, the 47th Foot carried an Irish warrant for Lodge No. 92, and the 72nd Foot, Seaforth Highlanders received a warrant from the Ancient Grand Lodge in 1759. Unfortunately regimental lodge records are woefully incomplete; in what records do remain, Sir Guys name does not appear. Source: The Masonic Connections of Sir Guy Carleton, Baron Dorchester, Ralph D. Seligman. Nassau, Bahamas : self-published, n.d. 26pp booklet.